French influence has a special place in the history of Moscow. 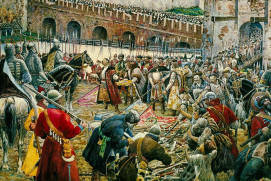 France evokes bitter memories of the 1812 fire and bloody battles at the city’s door in a Muscovite’s mind. 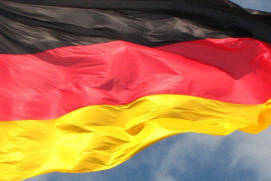 However, it is also associated with endless rows of splendid boutiques and ateliers established by French merchants in the old days, a galaxy of French architects who worked in Moscow, and the Normandie-Niemen Regimenta fighter squadron, later regiment of the French Air Force which fought with the Soviet forces until the end of the war in Europe, whose memory is immortalized in gravestones and monuments. The phrase “Frenchmen in Moscow” will remind any Muscovite of the occupation by Napoleon’s Grande Armée in what was one of Russia’s most crucial wars in the 19th century. The French army spent 36 days in Moscow. That was most likely the highest concentration of French people that the city has ever seen. 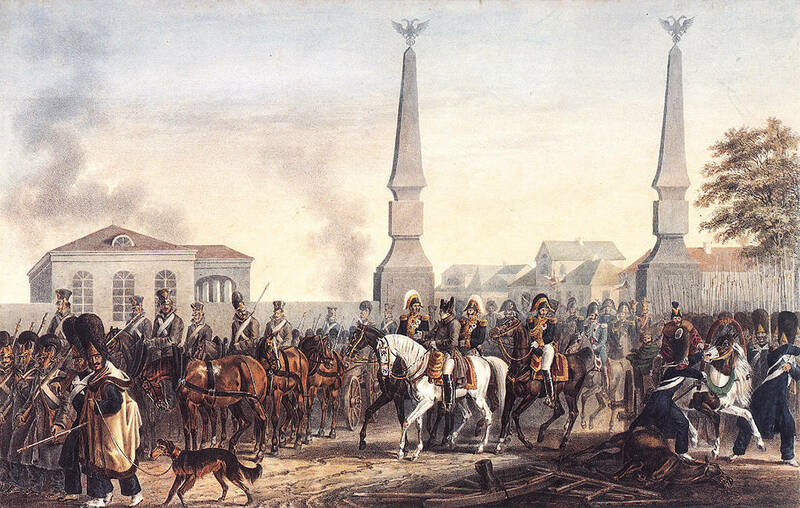 French troops entered the abandoned city on 2 September 1812, and flames engulfed the capital in the early hours of the next morning. The causes of the fire have never been determined for sure but legend has it that Muscovites set their homes and other property on fire to ensure that they were not left to the enemy. According to another version, pillaging was the main cause of the fires. 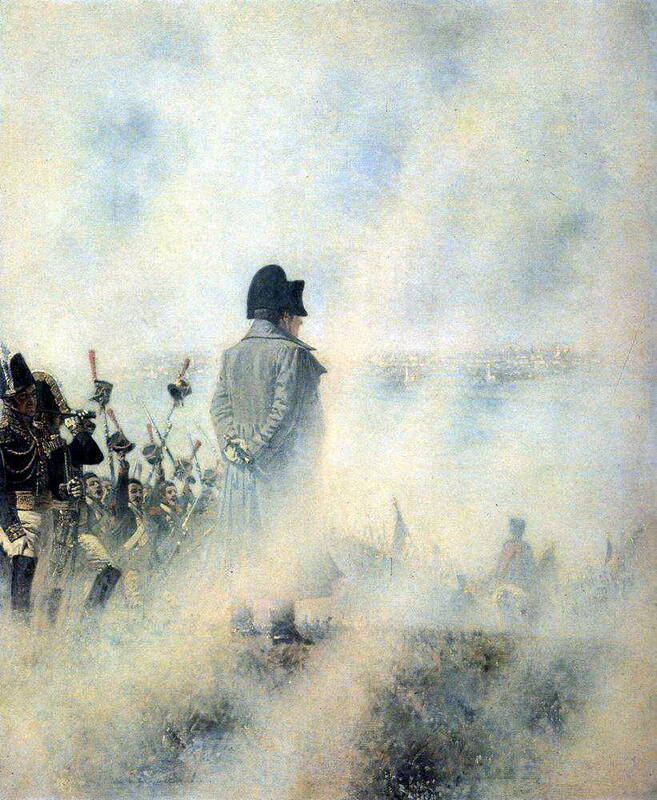 Having approached Moscow, Napoleon stopped at Poklonnaya HillRussian: Poklonnaya gora or Поклонная гора (now Victory ParkRussian: Park Pobedy or Парк Победы), waiting for Russian representatives to hand him the keys to the city. 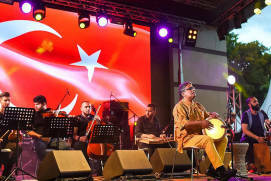 However, the red carpet welcome never happened because the city had already been abandoned by the Russian army and civil authorities. 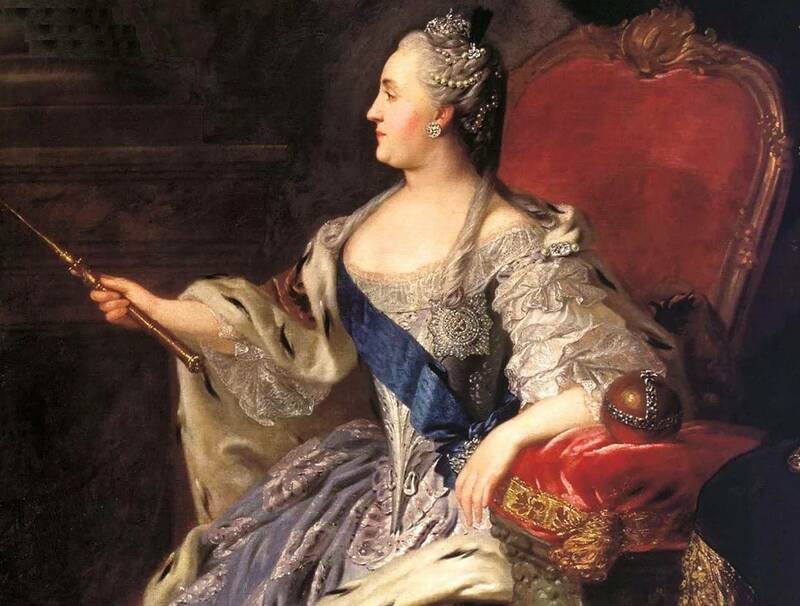 The Emperor of the French then entered the Kremlin, which became his residence for the whole period of the occupation. Nothing remains of the rooms where he stayed: the Grand Kremlin PalaceRussian: Bolshoy Kremlyovskiy dvorets or Большой Кремлёвский дворец is standing there today. 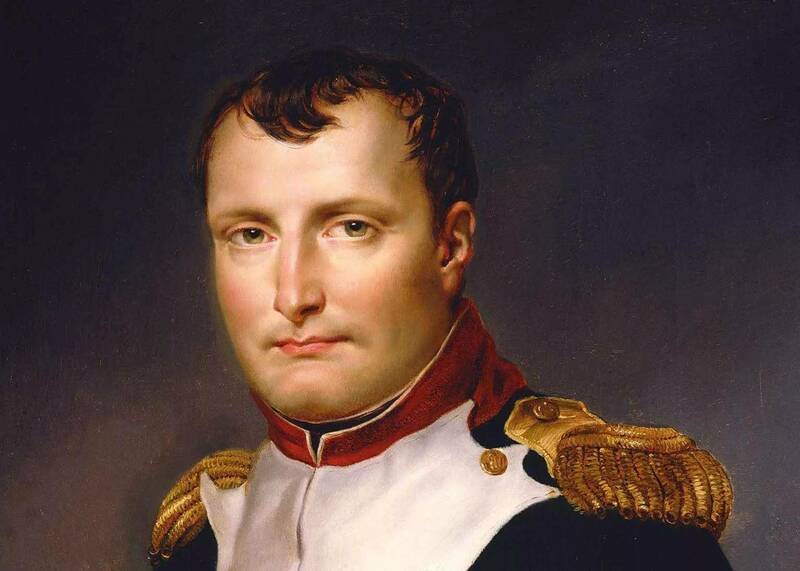 As Napoleon was leaving the city, he ordered the Kremlin to be blown up. The Ivan the Great Bell Tower and the Nikolskaya TowerRussian: Nikolskaya bashnya or Никольская башня were damaged the most. 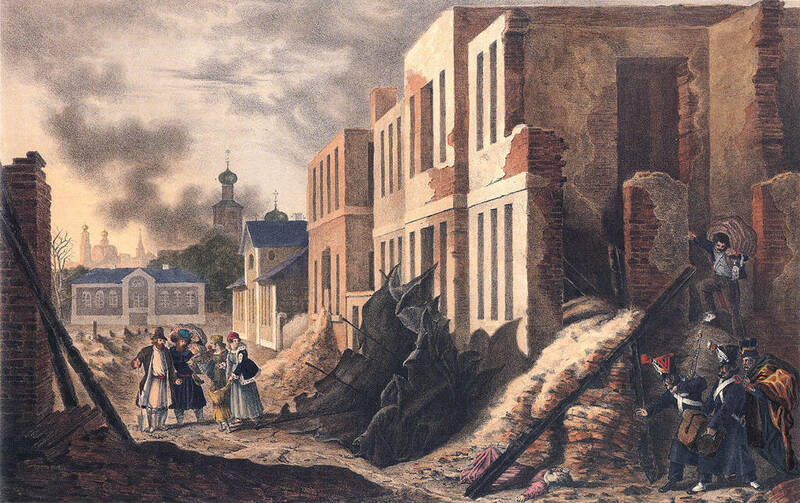 Muscovites who returned to their city recalled finding the Kremlin cathedrals ravaged and in an extremely poor state after being used as stables by French troops. The fire and devastation of 1812 meant that a radical reconstruction of the capital was necessary. As a result, hundreds of stone palaces, churches and mansions emerged where once only closely crammed wooden structures had stood. 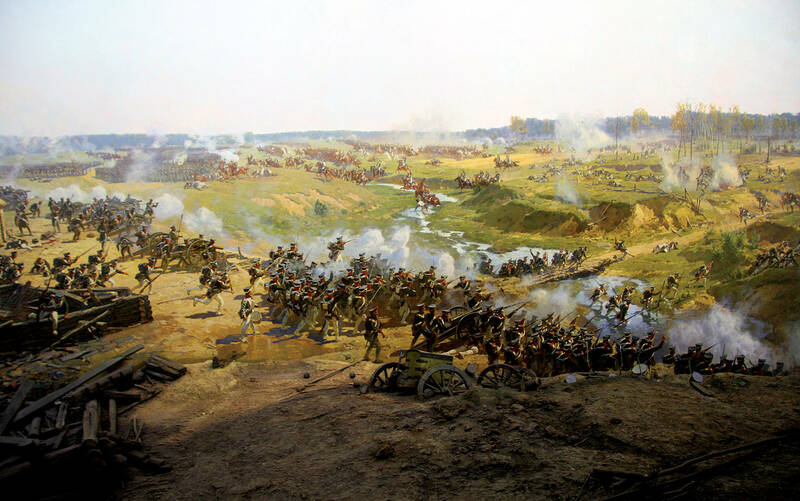 The Battle of the Borodino Panorama MuseumRussian: muzey-panorama «Borodinskaya bitva» or музей-панорама «Бородинская битва» was erected in 1912 close to Poklonnaya Hill (38/1 Kutuzovsky AvenueRussian: Kutuzovskiy prospekt or Кутузовский проспект). 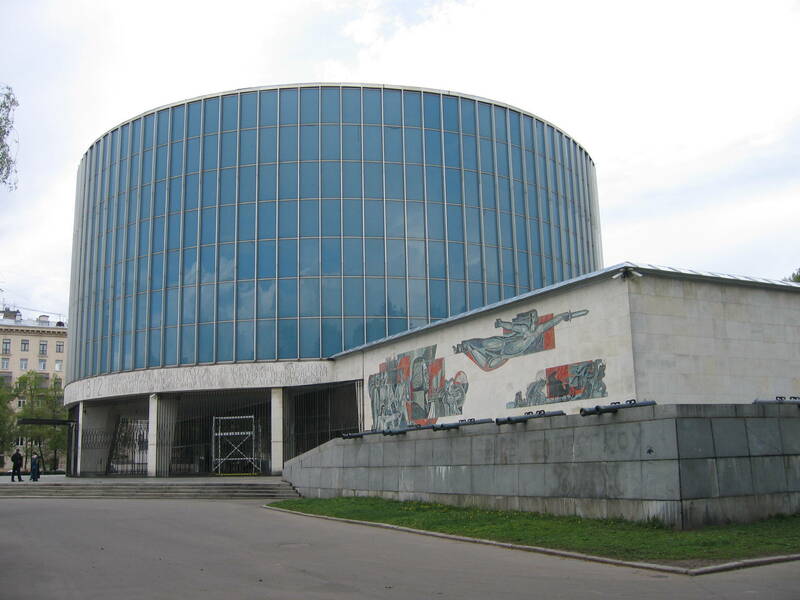 The museum displays a huge scene of Roubeau’s Battle of Borodino panorama and exhibits uniforms, weapons, pictures and documents related to the Patriotic War of 1812. 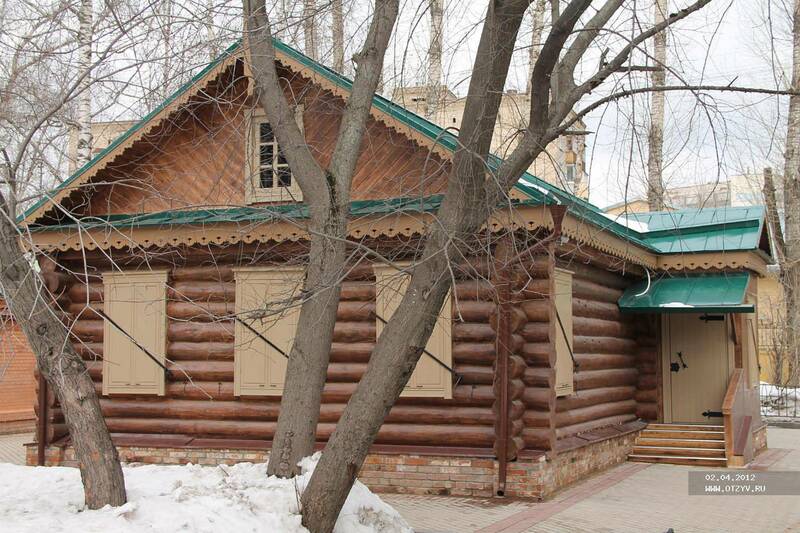 A short walk will take you to Kutuzovskaya IzbaRussian: Кутузовская изба (Kutuzov’s hut) Museum (38/2 Kutuzovsky Ave.) built to replace the wooden house where the FiliRussian: Фили conference had taken place. 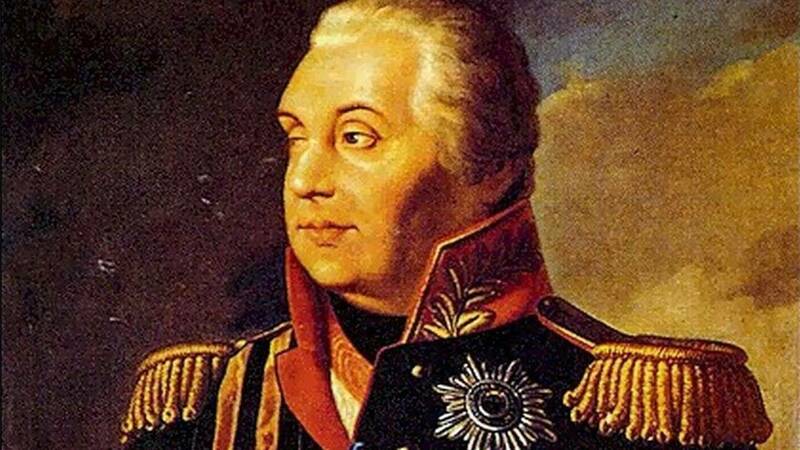 The conference was presided by Mikhail Kutuzov, Field Marshal of the Russian Empire who decided to open the capital city to Napoleon. Kutuzov’s personal belongings, weapons, orders and other wartime artifacts are housed in the museum. 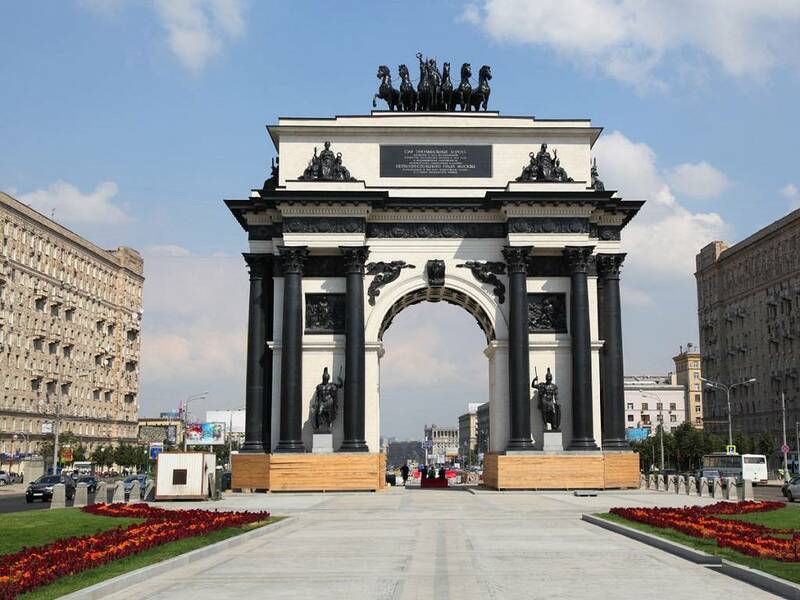 The Triumphal GateRussian: Triumfalnyie vorota or Триумфальные ворота was built in 1829 to Joseph Bovéan Italian-Russian neoclassical architect’s designs in the memory of the Russian victory. It was reconstructed and erected opposite the panorama museum in 1966‒1968. Originally, it was constructed on Tverskaya Zastava SquareRussian: ploschad Tverskaya Zastava or площадь Тверская Застава but later was moved to Kutuzovsky Avenue during the great reconstruction of Moscow in the 20th century. 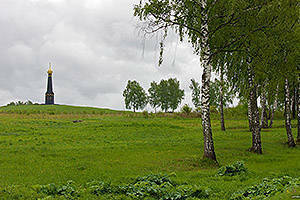 As a result, a whole memorial complex of the Patriotic War of 1812 emerged around Poklonnaya Hill. In the 1960s, many streets in the area were renamed after the heroes of that war: Kutuzovsky Avenue, Barklaya StreetRussian: ulitsa Barklaya or улица Барклая, Bagrationovsky DrivewayRussian: Bagrationovskiy proyezd or Багратионовский проезд, Neverovskogo StreetRussian: ulitsa Neverovskogo or улица Неверовского, and others. Today, Poklonnaya Hill is also home to a memorial dedicated to World War II, the most dreadful war in human history. The memorial complex includes the Victory MonumentRussian: Monument Pobedy or Монумент Победы, the Central Museum of the Great Patriotic War of 1941‒1945Russian: Tsentralnyiy muzey Velikoy Otechestvennoy voyny 1941-1945 or Центральный музей Великой Отечественной войны 1941 ‒ 1945 гг, St. George’s Church on Poklonnaya HillRussian: Hram Georgiya Pobedonostsa na Poklonnoy gore or Храм Георгия Победоносца на Поклонной горе, the Memorial MosqueRussian: Memorialnaya mechet or Мемориальная мечеть, the Memorial Synagogue and the Holocaust Memorial MuseumRussian: Memorialnaya sinagoga i memorialnyiy muzey Holokosta or Мемориальная синагога и мемориальный музей Холокоста, the Chapel Erected In Memory Of Spanish VolunteersRussian: Chasovnya, vozdvignutaya v pamyat ob ispanskih dobrovoltsah or Часовня, воздвигнутая в память об испанских добровольцах, the Open-Air Weapons and Military Equipment ExhibitionRussian: Vyistavka voennoy tehniki i vooruzheniya pod otkrytym nebom or Выставка военной техники и вооружения под открытым небом, a monument as well as sculptural compositions. A huge museum completely dedicated to the War of 1812 was opened next to the Kremlin and Red Square in 2012 to commemorate 200 years since the victory. This is the Museum of the Patriotic War of 1812Russian: Muzey Otechestvennoy voyny 1812 goda or Музей Отечественной войны 1812 года (2/3 Revolyutsii SquareRussian: ploschad Revolyutsii or площадь Революции) based in a specifically constructed pavilion in the courtyard between the Moscow City Dumathe Russian regional parliament in Moscow and the Old Mint ChambersRussian: palaty Starogo Monetnogo dvora or палаты Старого Монетного двора. 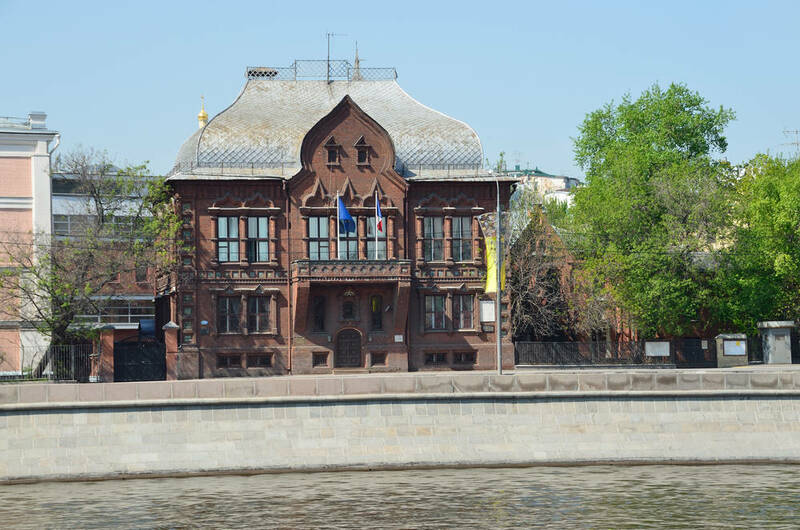 The pavilion is neighbored by the Historical MuseumRussian: Istoricheskiy muzey or Исторический музей, which was conceived as early as the mid-19th century, when a beautiful thematic collection was created by historians and philanthropists. 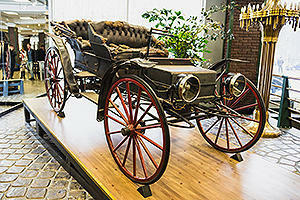 Some temporary exhibitions Moscow were held in the Kremlin in 1909 and in the Historical Museum in 1912. However, it was not until recently that a full-fledged museum was finally developed to become one of the most progressive and compelling museums in Moscow. 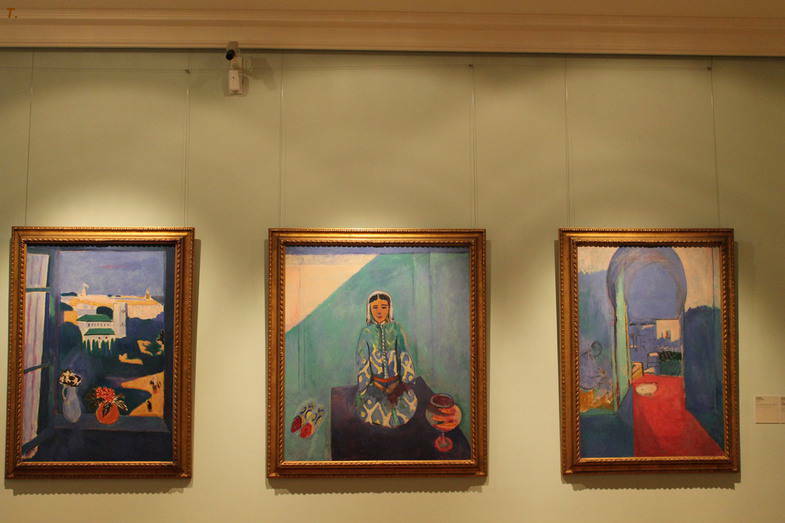 The museum exposition is divided into several parts: Russia and France: Between Peace and War. 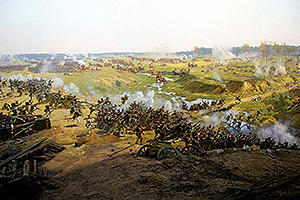 1801–1812, The Patriotic War of 1812, and A Road to Triumph. The Foreign Campaigns of 1813–1814. The exhibits include weapons, orders, military uniform, objects of everyday military life, documents, army arts and crafts items, graphics, coins and seals. The museum holds a collection of items that once belonged to Emperors Alexanderreigned as Emperor of Russia from 1801 to 1825 and Napoleon as well as to Russian and French marshals. A lot of information on the war and the wartime period is presented on interactive display stands. The museum began its existence with the monument honoring the brave defenders of the Fatherland erected on Kurgannaya HeightRussian: Kurgannaya vysota or Курганная высота, at the site of the Battle of Borodinothe fighting involved around 250,000 troops and left at least 70,000 casualties, making Borodino the deadliest day of the Napoleonic Wars. The consecration ceremony of 1839 was attended by Emperor Nicholas Ithe Emperor of Russia from 1825 until 1855. By his royal decree, a gatehouse was built next to the monument where veterans of the war in 1812 safeguarded the monument and told the story of the war to visitors. General Bagrationduring the French invasion of Russia in 1812, Bagration commanded one of two large Russian armies’s ashes were buried close to the monument. Sometime after that, a wooden mansion for the royal family was constructed to house a war hero portrait gallery and various war relics. The main “French” building of today’s Moscow is the Tsentrosoyuz BuildingRussian: dom Tsentrosoyuza or дом Центросоюза at 39 Myasnitskaya Street constructed in 1930‒1936 as per the design of Le Corbusier (born Charles-Edouard Jeanneret-Gris), one of the foremost architects of the 20th century, assisted by Pierre Jeanneret and Nikolai Kolli. Even though Le Corbusier denied his claim to the work because not all of his ambitions were fulfilled, the building remains essentially his construct. 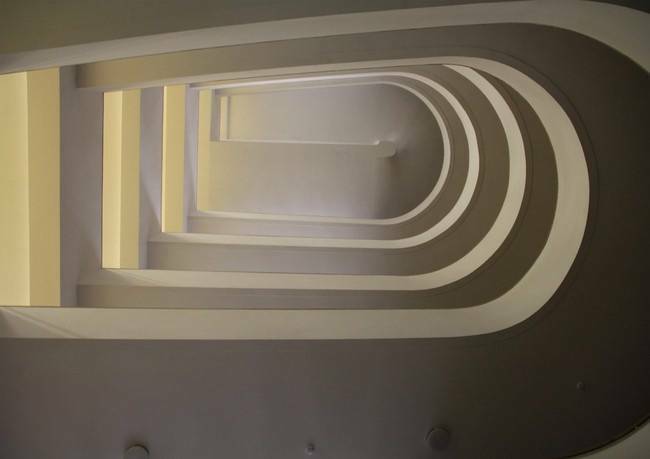 Le Corbusier won the architectural design competition in 1928, outdoing the best Soviet architects of that time: the Vesnin brothers, Ivan Leonidov, Sergey Chernyshev, Boris Velikovsky, etc. 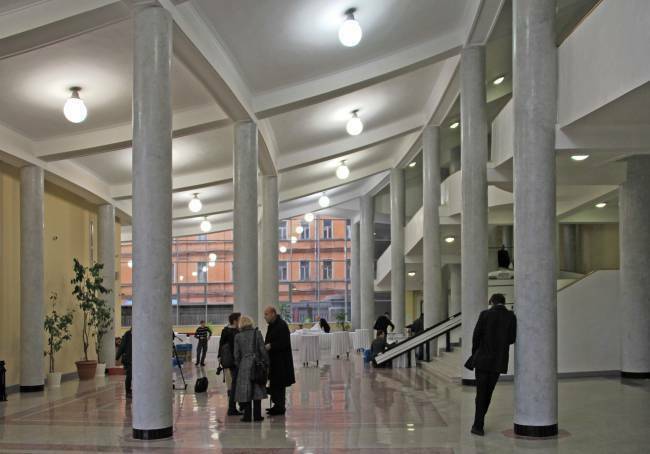 The large public building accommodates 3,500 employees and consists of four main structures. Two elongated rectangular blocks are grouped around a parabolic structure with an audience space. Another smaller block joins one of the elongated ones perpendicularly (along Myasnitskaya Street), closing the whole building from that side. The building features all of Le Corbusier’s Five Points of Architecture: a horizontal band of windows, pilotis, a free-designed façade (which was not fully fulfilled to the architect’s vision), a free-designed ground plan, and flat roofs. The free designing of the ground plan, as well as the structural frames of reinforced concrete that made it possible, were very unusual at that time. 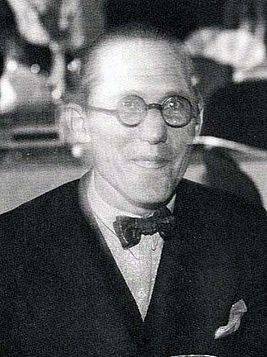 Le Corbusier visited Moscow twice, in 1929 and 1930, to supervise the construction process. In order to provide enhanced thermal insulation, Le Corbusier suggested using double skin façades with a vacuum layer in-between. The lobby, the canteen, the meeting hall and the work areas are connected with ramps, manifesting Le Corbusier’s idea of circulation. 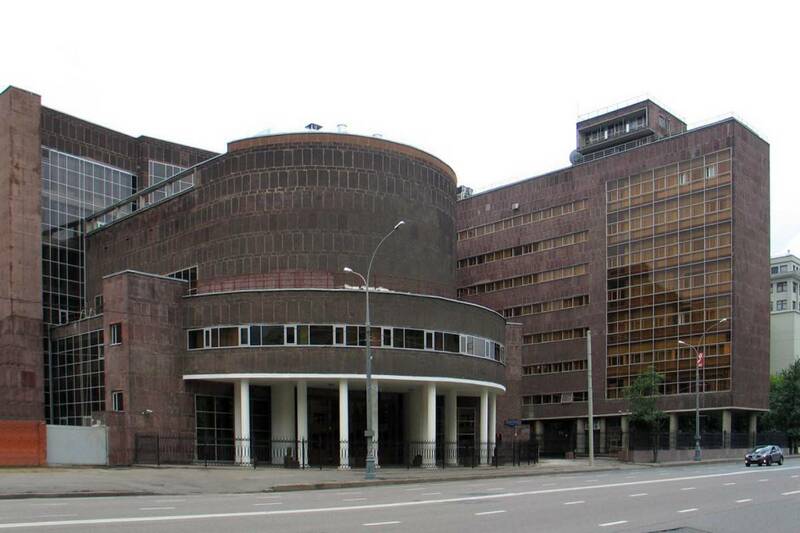 The Tsentrosoyuz Building has some common features with other famous projects of the architect: the Ministry of Education and Health in Rio de Janeiro, the Swiss Pavilion in Paris, the United Nations Secretariat in New York. 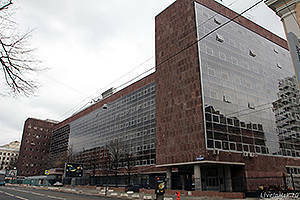 The building is now home to the Federal State Statistics ServiceRussian: Federalnaya sluzhba gosudarstvennoy statistiki or Федеральная служба государственной статистики, which makes it impossible to get inside without special permission. 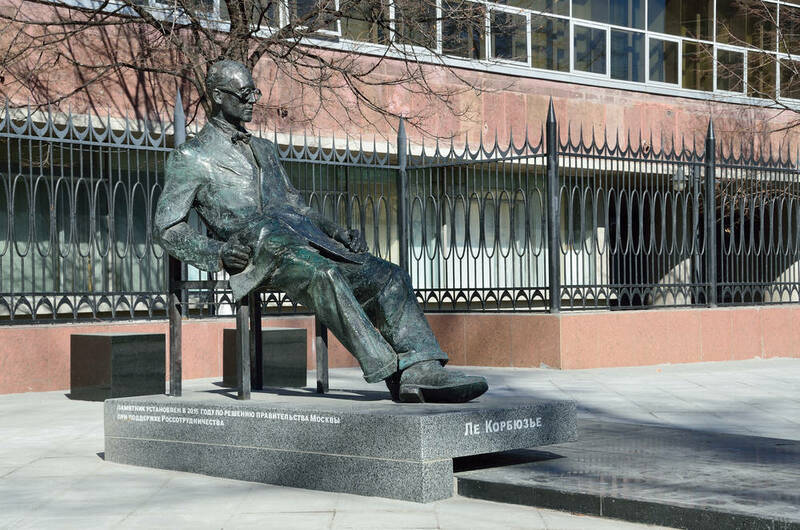 A monument to Le Corbusier was installed in front of the building in Myasnitskaya Street (on the side next to 41 Myasnitskaya Street) in 2015 (designed by Anton Voskresensky, executed by Andrey Tyrtyshnikov). The Gallery of American and European ArtRussian: Galereya iskusstva stran Evropy i Ameriki or Галерея искусства стран Европы и Америки at the Pushkin MuseumRussian: Gosudarstvennyi muzey izobrazitelnyih iskusstv im. 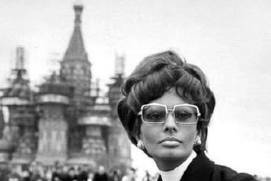 A.S. Pushkina or Государственный музей изобразительных искусств им. А.С. 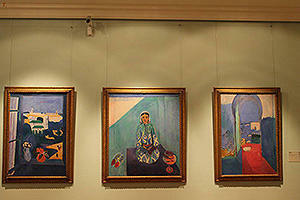 Пушкина offers a vast collection of French paintings dating back to the 19th and 20th centuries. 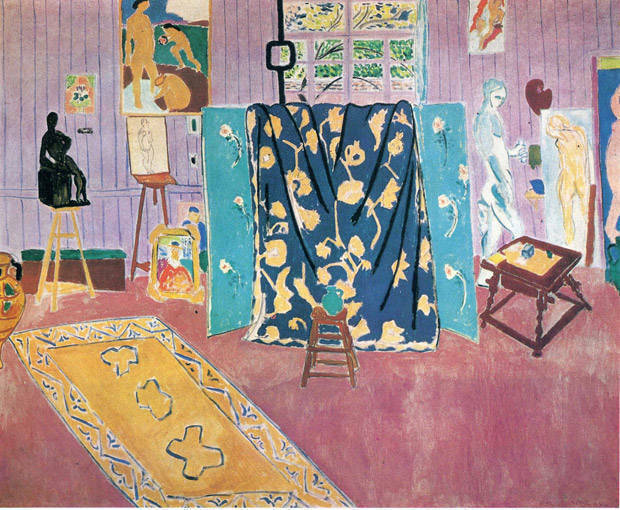 The best part of the collection owes its existence to Russian art collectors and patrons Sergey Shchukin and Ivan Morozov, whose collections were nationalized after the October Revolutiona revolution in Russia led by the Bolsheviks with Vladimir Lenin as a leader that was instrumental in the larger Russian Revolution of 1917. 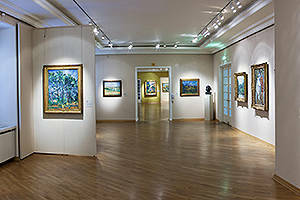 The Gallery embraces oeuvres by impressionists Edouard Manet, Claude Monet, Camille Pissarro, Pierre-Auguste Renoir, Alfred Sisley, and Edgar Degas; neo-impressionist Paul Signac; the so-called post-impressionists Vincent van Gogh, Paul Gauguin, and Paul Cézanne; fauvists Henri Matisse, Maurice de Vlaminck, André Derain, and Albert Marquet; the Les Nabis movement including Maurice Denis, Pierre Bonnard, and Edouard Vuillard as well as cubists George Braque and Pablo Picasso. Outstanding pictures of the later epoch include works by Arman (Armand Fernandez), Bernard Buffet, Raoul Dufy, Fernand Léger, and Ossip Zadkine. 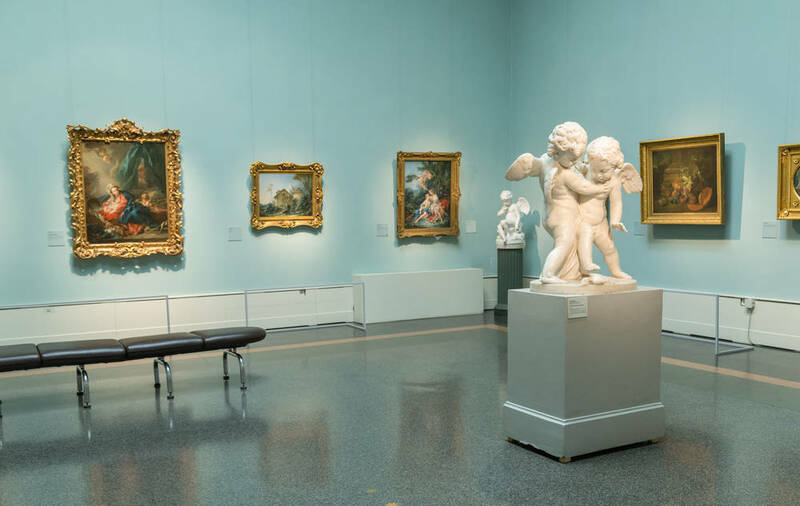 The ground floor hosts a collection of paintings of the 19th century. French masters include artists of the Romantic era such as Eugène Delacroix, Jean-Auguste-Dominique Ingres, and Théodore Géricault; representatives of the Paris Salon, including Jean-Léon Gérôme, Paul Delaroche, and Eugène Louis Gabriel Isabey; Jean-Baptiste-Camille Corot and painters of the Barbizon school Théodore Rousseau, Jules Dupré, Narcisse Virgilio Díaz de la Peña, Charles-François Daubigny; Jean-François Millet; the leader of the Realist movement Gustave Courbet; and Honoré Daumier. The St. Louis Catholic parish was founded in 1789, following a decree to that effect pronounced by Catherine the GreatEmpress of Russia from 1762 until 1796. That was one of the fruits of a French-Russian treaty, which stipulated that the French who lived in Russia should be allowed to practice their religion freely and exercise ceremonial acts both at home and in churches. It was only in the early 1830s that the stone building we know today was constructed to replace the wooden church erected right after the decree was signed. 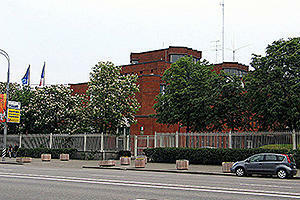 The new building was designed by Domenico Gilardi. A six-column Doric portico with two bell towers on each side marks the central part of the western façade. A composition like this gives the church a hawkish and even fortress-like appearance. Widely spaced massive columns and short towers make it look heavy, as if pressed to the ground. 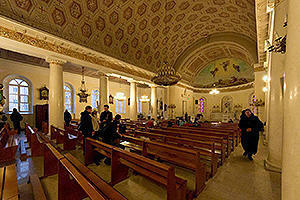 It has the appearance of a three-aisled basilica with a raised nave. 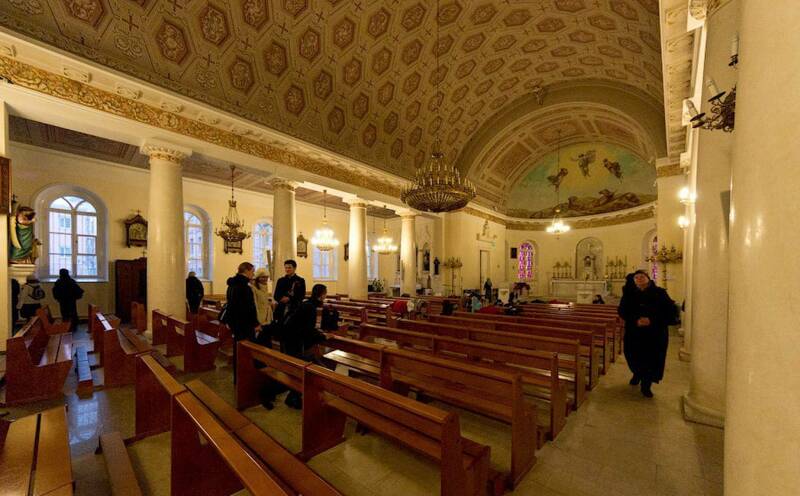 After the Socialist Revolution of 1917, the Church of St. Louis of the FrenchRussian: hram sv. 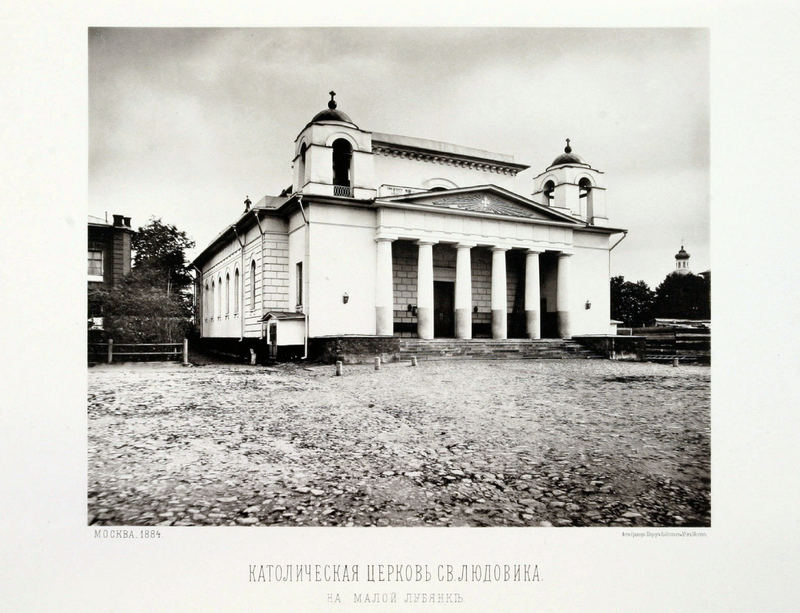 Lyudovika Frantsuzskogo or храм св. Людовика Французского was the only operating Catholic church in Moscow. The clergy of the church suffered numerous persecutions throughout the Soviet era. At present, the Church of St. Louis is one of the three Catholic churches in the city. Church services occur in Russian on weekdays and in English, Vietnamese, Italian, Latin, Lithuanian, Russian and French on weekends. Boys and girls’ gymnasiums and a poorhouse existed once as part of the church infrastructure. 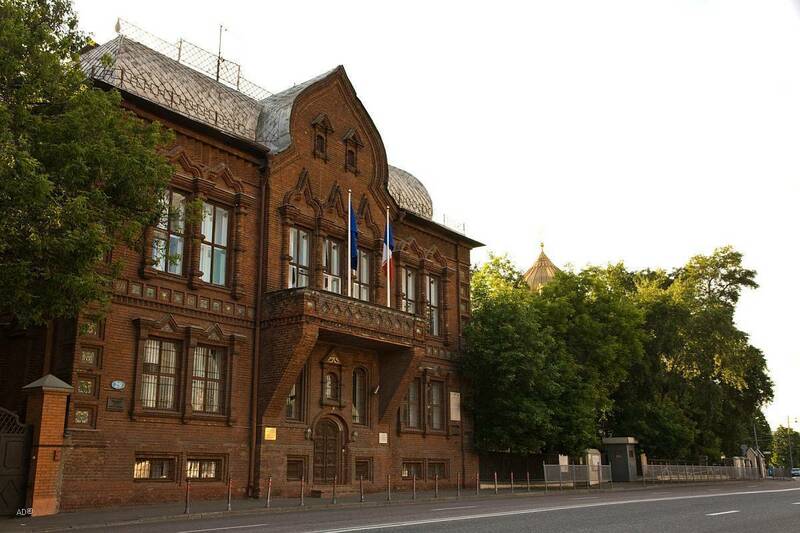 One of the gymnasium buildings (designed by O. Didio, located at 7 Milyutinsky LaneRussia: Milyutinskiy pereulok or Милютинский переулок) is still functioning, hosting the Dumas French LyceumRussian: Frantsuzskiy litsey im. 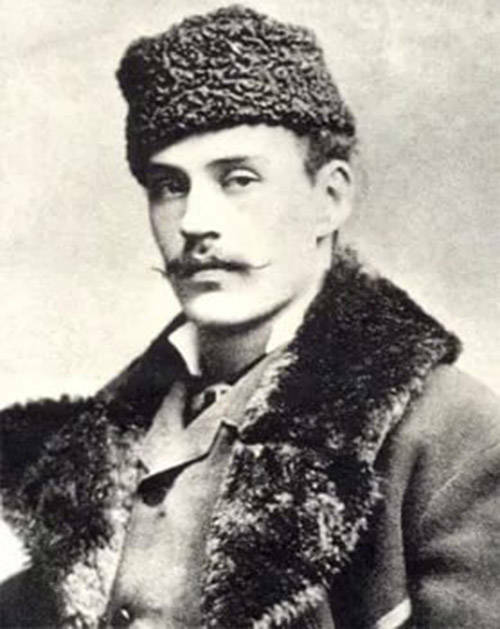 A. Dyuma or Французский лицей им. 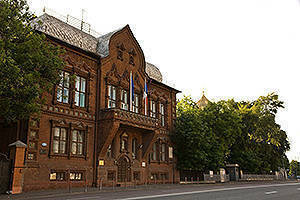 А. Дюма established in 1997 by Jacques Chirac, President of France. Igumnov HouseRussian: Dom Igumnova or Дом Игумнова on Bolshaya Yakimanka Street is one of the finest specimens of Moscow pseudo-Russian (neo-Russian) style architecture. 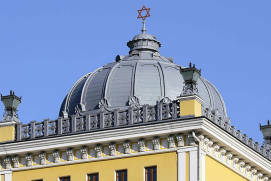 The building was constructed in the late 19th century by prominent manufacturer Nikolai Igumnov as per the design of Yaroslavla city located 250 kilometers northeast of Moscow architect Nikolai Pozdeyev. The style was originally used only for temporary and decorative structures but gained official status by the end of the 19th century, spreading to urban architecture as well. It was mostly based on the design principles of Medieval Russian churches and palaces. 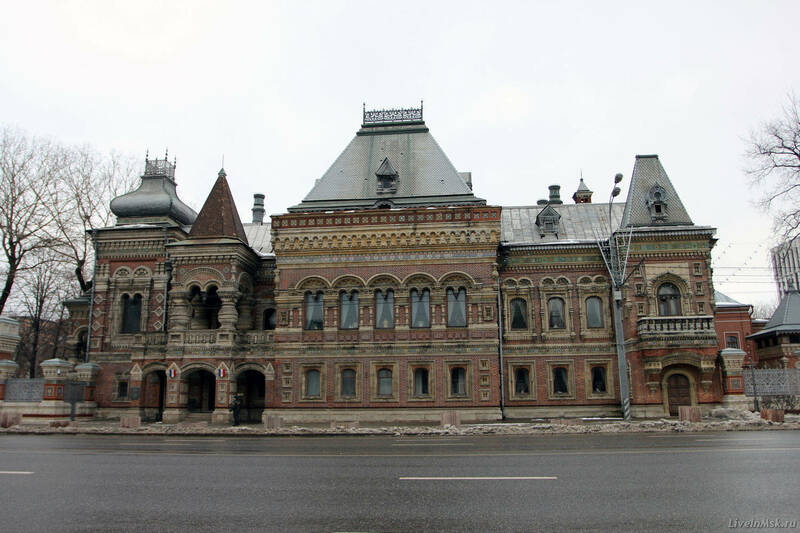 Some examples of Moscow buildings in the pseudo-Russian style include the State Historical Museum (designed by Vladimir Sherwood), the Upper Trading RowsRussian: Verhnie torgovyie ryady or Верхние торговые ряды (now State Department Store, or GUMRussian: GUM or ГУМ, designed by Alexander Pomerantsev), the building of Moscow City DumaRussian: Moskovskaya gorodskaya duma or Московская городская дума (now Museum of the Patriotic War of 1812, designed by Dmitry Chichagov). Igumnov House hosted the Embassy of France from 1938 to 1979 (which later moved to a modern spacious complex nearby) and has been the French ambassador’s residence since 1979. Igumnov House represents a rectangle with minor projections. The decoration of the façade appears to be the most powerful means of expression here, concealing the robust structure. The architect played with different forms of roof, referring to the Palace of Tsar Alexey Mikhaylovichthe tsar of Russia from 1645 until 1676 in KolomenskoyeRussian: Kolomenskoe or Коломенское and other outstanding pieces of wooden architecture. 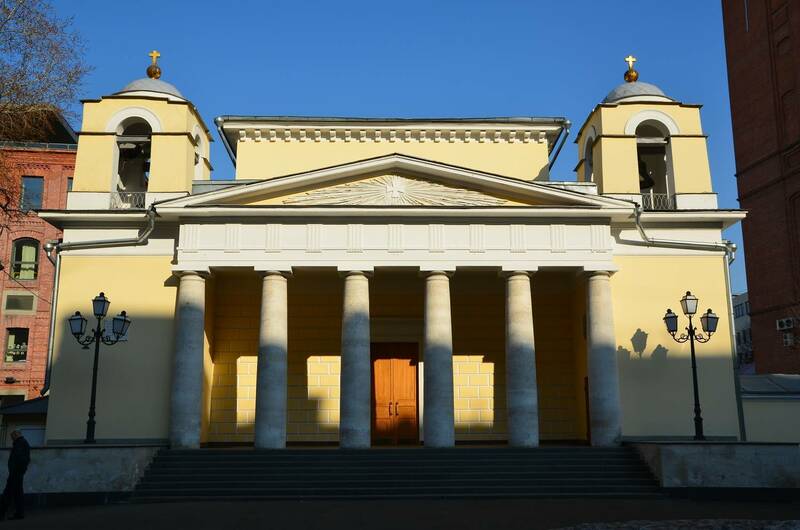 The avant-corpses and the balcony tower give the building an eccentric asymmetrical rhythm, while red brick combined with endless porcelain tiles evoke associations with the Yaroslavl church architecture of the 17th century. Interestingly, most of the indoor premises were designed by architect Pyotr Boytsov in French styles: Louis XV, Louis XVI, and the Empire style, which contrast blatantly with the “Russian” exterior decoration but fit pretty well the present-day status of the building. 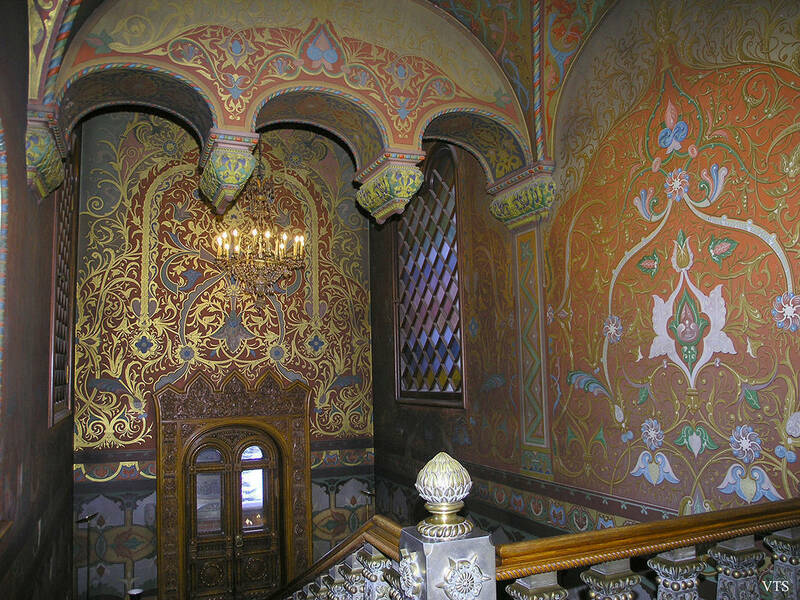 Only the lobby and the main stairs continue the Old Russian pattern. 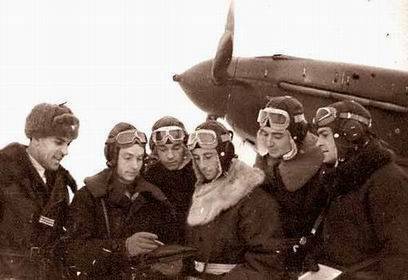 In 1942, the Free French Forces initiated the creation of a French combat aviation squadron in the USSR, which was later transformed into a regiment. The squadron was formed in the city of IvanovoRussian: Иваново. The name Normandie was chosen as a tribute to the French province that suffered the most from German occupation, and many squadron pilots came from that region. General Ernest Petit and Captain Albert Mirelesse stayed in Moscow as representatives of the Regiment. They were provided with a mansion at 29 Prechistenskaya QuayRussian: Prechistenskaya naberezhnaya or Пречистенская набережная to allocate their Military Mission. 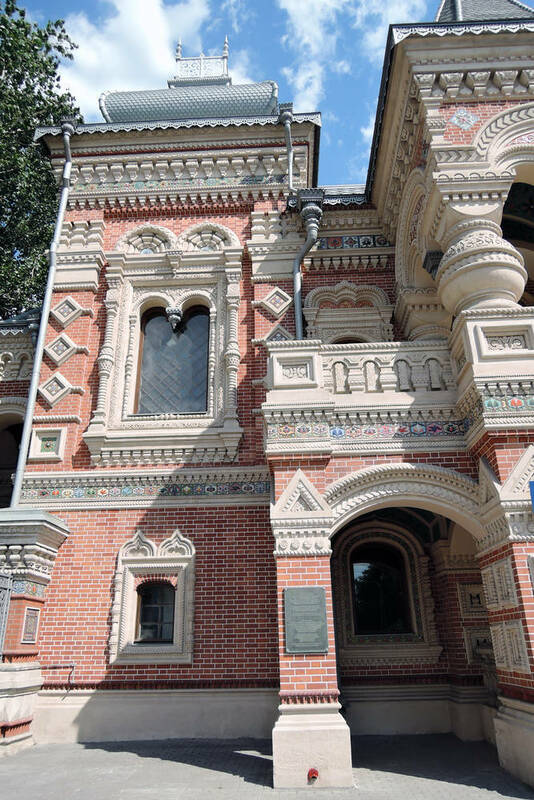 The mansion is one of the most remarkable pseudo-Russian-style buildings in Moscow. 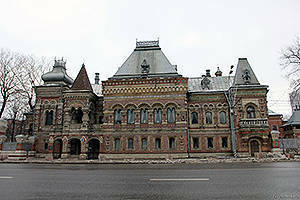 It was built by the patron and collector Ivan Tsvetkov in 1900 to house his collection of Russian paintings. 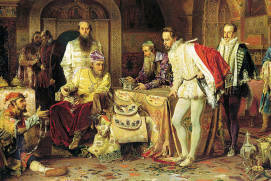 The idea of the project was developed by Tsvetkov himself and famous Russian artist Viktor Vasnetsov. 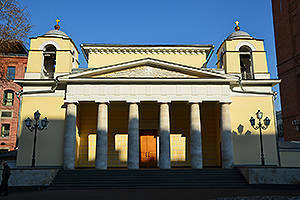 The architectural design was performed by Vasily Bashkirov and Boris Shnaubert. The building retains features of a traditional wooden teremthe upper story of a home or castle, often with a pitched roof, its windows framed in moldings à la 19th century and its façade ornamented with porcelain tiles. 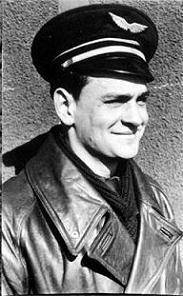 At first, the personnel of the Normandie-Niemen Regiment comprised 72 French volunteer pilots and aircraft technicians, as well as Soviet ordnance brigade soldiers. 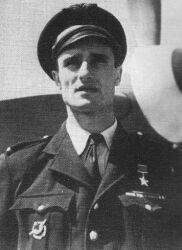 Total squadron casualties included 42 pilots. 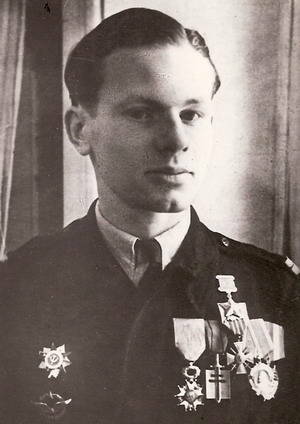 The title of Hero of the Soviet Union was awarded to senior lieutenants Marcel Lefèvre (posthumously), Roland Paulze d’Ivoy de La Poype, Marcel Olivier Albert, and junior lieutenant Jacques André. 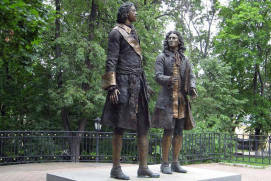 Andrey Kovalchuk’s monument to the pilots of the Normandie-Niemen Regiment was unveiled in Krasnokursantsky Public GardenRussian: Krasnokursantskiy skver or Краснокурсантский сквер in 2007 by the Presidents of Russia and France. 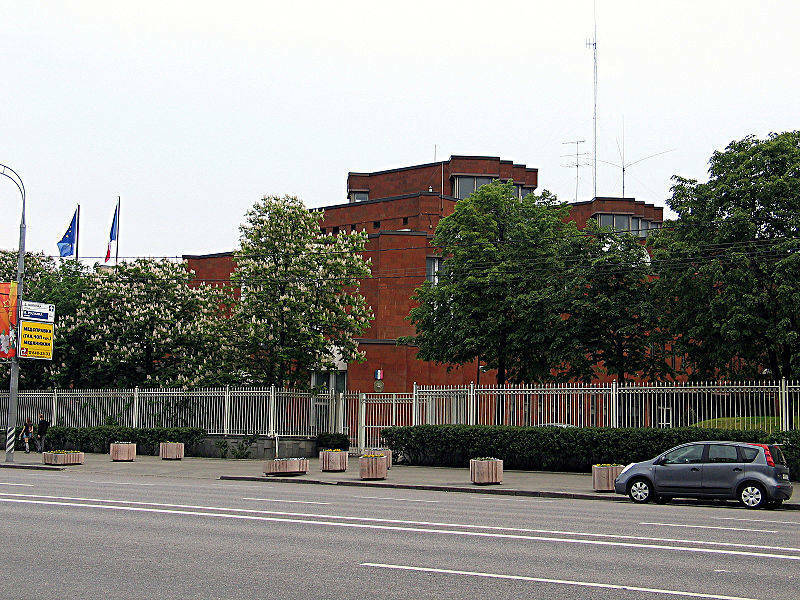 Tsvetkov HouseRussian: osobnyak Tsvetkova or особняк Цветкова is presently the French defense attaché office. It is also home to an exposition devoted to the history of the Normandie-Niemen Regiment, featuring photos of pilots, the Regiment’s coat of arms, documents and commendation lists, as well as General Charles de Gaulle’s autograph. The deceased pilots of the Regiment were buried in Vvedenskoye CemeteryRussian: Vvedenskoe kladbische or Введенское кладбище (Plot 9, 1 Nalichnaya StreetRussian: Nalichnaya ulitsa or Наличная улица). Hero of the Soviet Union Marcel Lefèvre, Maurice de Seynes, Jules Joire, Maurice Pierre Bourdieu, Henri Foucaud, and Henri Georges were buried in a mass grave. Their remains were transported to France in the 1950s. 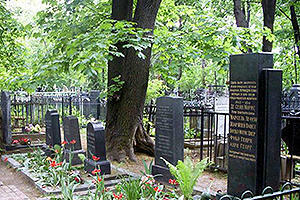 The cemetery holds the graves of French pilot Bruno de Thierry de Faletans, Soviet aircraft technician Sergey Astakhov, ordnance brigade soldier Edmond Miroboff, Georges Coudrou, and regiment veteran Andrew Levens. 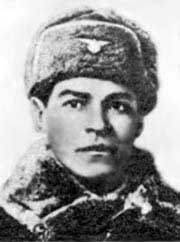 There are also the remains of an unidentified French soldier found in Orlov Oblasta federal subject of Russia and buried in the cemetery in 1964. 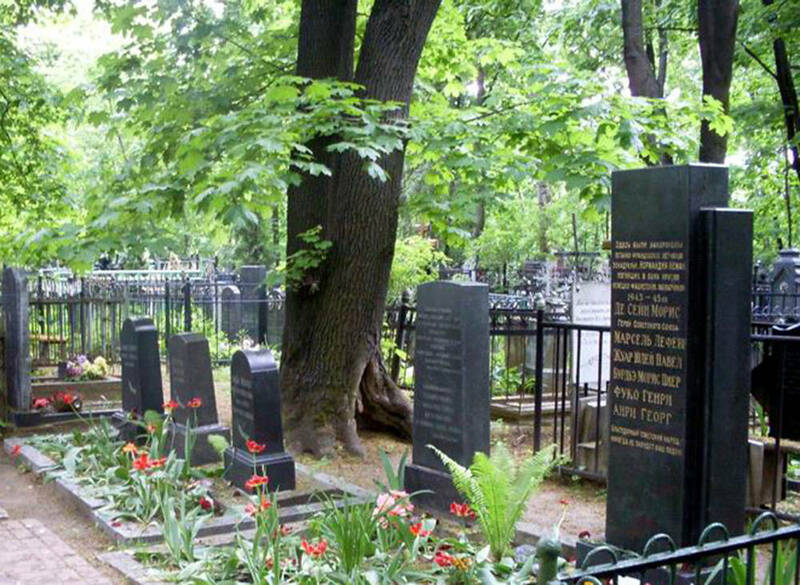 This cemetery is also where the monument to Napoleonic soldiers killed in 1812 was installed by the French diaspora in Moscow in 1889. The monument can be seen today, too—it is fenced with a solid chain supported by cannons of Napoleon’s era dug in with their muzzles down. 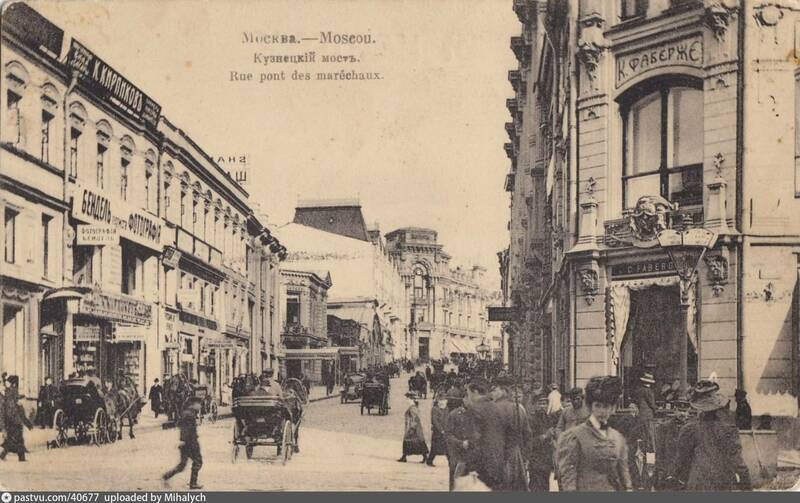 There were dozens of shops owned by Frenchmen in the center of Moscow in the 18th and 19th centuries: stores of Revelier, Dabeau, Lenglen, Tremblé’s confectionary store, Madam Ober-Chalmers’ atelier (Kozitsky LaneRussian: Kozitskiy pereulok or Козицкий переулок), the salon of famous choreographer Jean Lamiral (who lived at 9 Stoleshnikov LaneRussian: Stoleshnikov pereulok or Столешников переулок), etc. 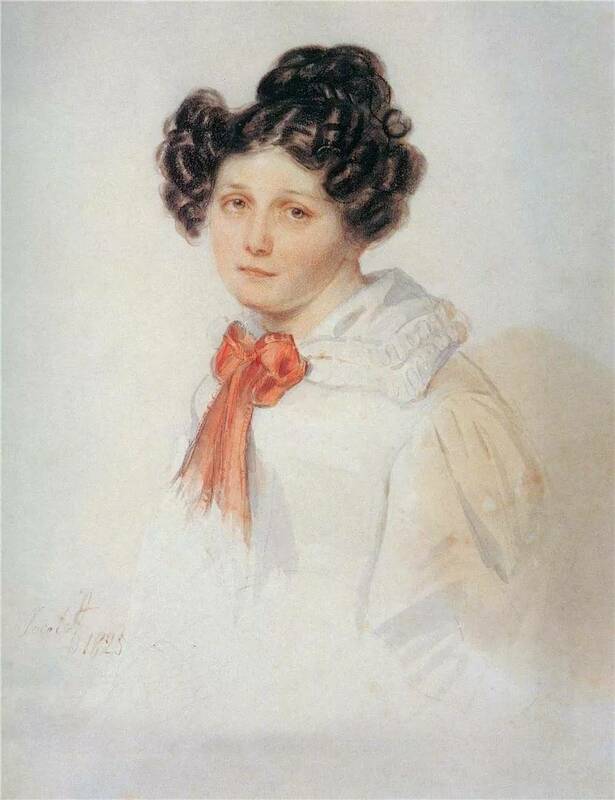 Pauline Gueuble, a French woman who fell in love with Decembristany of the Russian revolutionaries who led an unsuccessful uprising on Dec. 14 1825 Ivan Annenkov and joined him in his Siberian exile, also lived in Moscow and worked in a shop on Kuznetsky Most StreetRussian: ulitsa Kuznetskiy most or улица Кузнецкий мост. 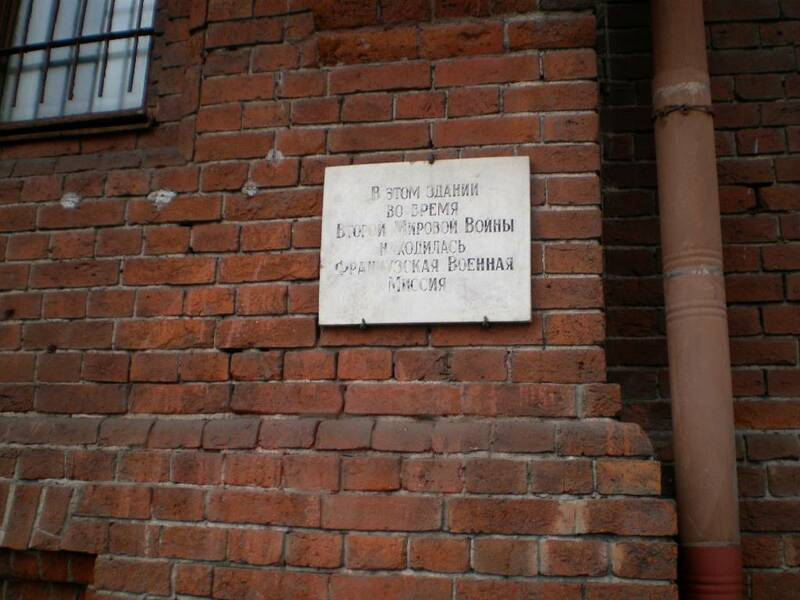 When the exile was over, the couple came back and settled on that very street (5 Kuznetsky Most Street). The story was described by Alexandre Dumas in his novel The Fencing Master. In the 19th century, Kuznetsky Most Street, the epicenter of fashion trade, was a foothold for French merchants: their expensive stores, ateliers and beauty salons constituted an overwhelming majority of the shops found there. One of the lanes in this area was even named after Pierre Fourcasser, a fashionable French tailor (Furkasovsky LaneRussian: Furkasovskiy pereulok or Фуркасовский переулок). 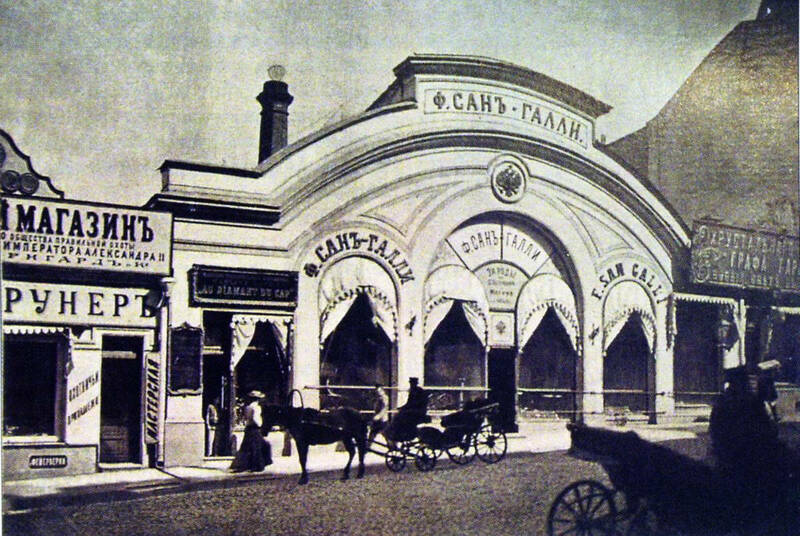 ErmitageRussian: Эрмитаж, the famous Moscow restaurant that existed from the 1860s to 1917, was located at 14 Petrovsky BoulevardRussian: Petrovskiy bul'var or Петровский бульвар (where School of Modern DramaRussian: Shkola sovremennoy piesy or Школа современной пьесы is today). The restaurant belonged to Lucien Olivier, a French chef. 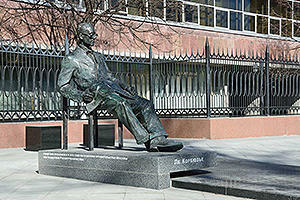 He was the inventor of one of the most popular salads in Russian cuisine which was named after him. The creator himself called it the “Mayonnaise of Game”. Vladimir Gilyarovskya Russian writer, best known for his reminiscences of life in pre-Revolutionary Moscow wrote in his Moscow and Muscovites maintains that the secret of the recipe was never unveiled. 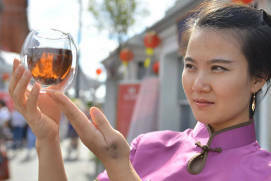 However, we know the approximate original list of ingredients: hazel grouse, veal tongue, caviar, fresh salad, boiled crayfish or crayfish tails, mixed pickles, fresh cucumbers, capers, and hard-boiled eggs. The recipe was published by Pelageya Aleksandrova-Ignatyeva in the book Practical Foundations of Culinary Art in 1899. 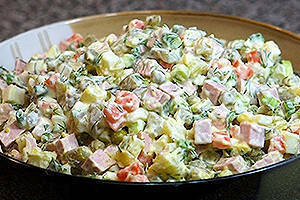 The salad was reanimated in the 1930s: it was served in the Moscow Restaurant, and the recipe was included into The Book of Healthy and Tasty Food, the central cookbook of the Soviet Union, under the name “Game Salad”. This version replaced all expensive ingredients with products that were less sophisticated and more available. The most widespread “people’s” recipe includes boiled potatoes, boiled carrots, hard-boiled eggs, Doktorskaya sausage or chicken, pickled and fresh cucumbers, green peas, and mayonnaise. 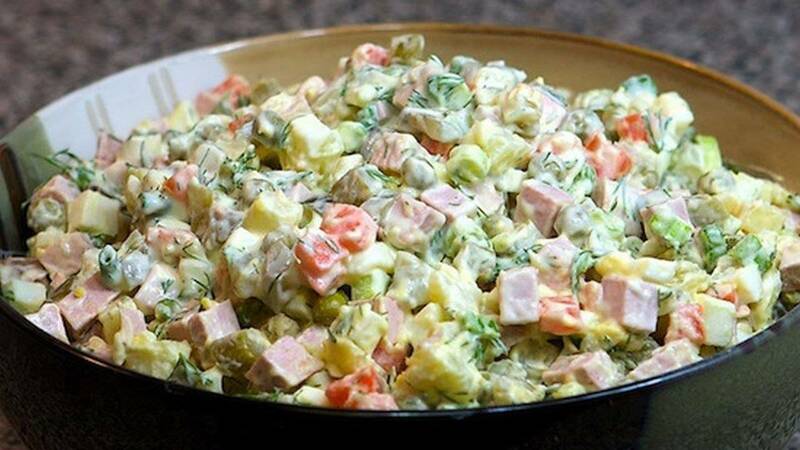 The salad has since become a must-have on the New Year’s Eve table in Russian families. The recipe has crossed the borders of Russia: for instance, its Spanish variation with tuna fish is extremely popular under the name “Russian Salad”.